The Shiva panchakshara stotra written below has been composed by Sri Adi Shankaracharya. It is based on the moolamantra of Lord Shiva “ Om Namashivaya”. 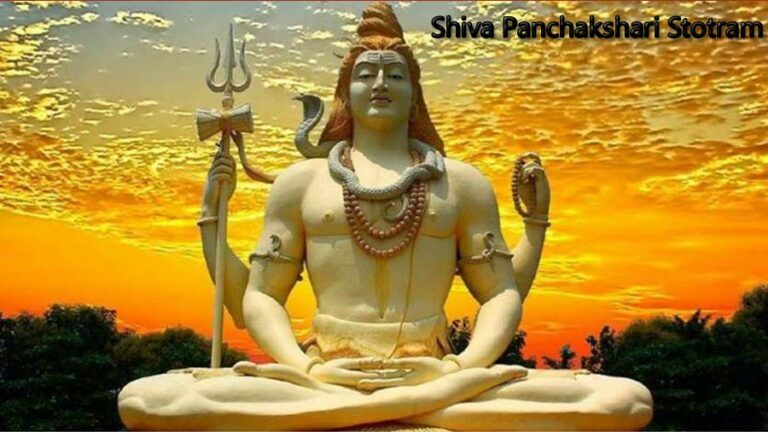 Shiva Panchakshara Stotra is a prayer to Lord Shiva. Each stanza of this Stotra starts with one of the five syllables, na, ma, shi, va, and ya. Salutations to Shiva, who bears the form of a Yaksha, who has matted hair on his head, who bears the Pinaka bow in his hand, the primeval Lord, the brilliant god, who is Digambara, and who is represented by the syllable “ya”. Anyone who recites this sacred five-syllable mantra near the Shiva Linga, he attains the abode of Shiva and rejoices there with Shiva.